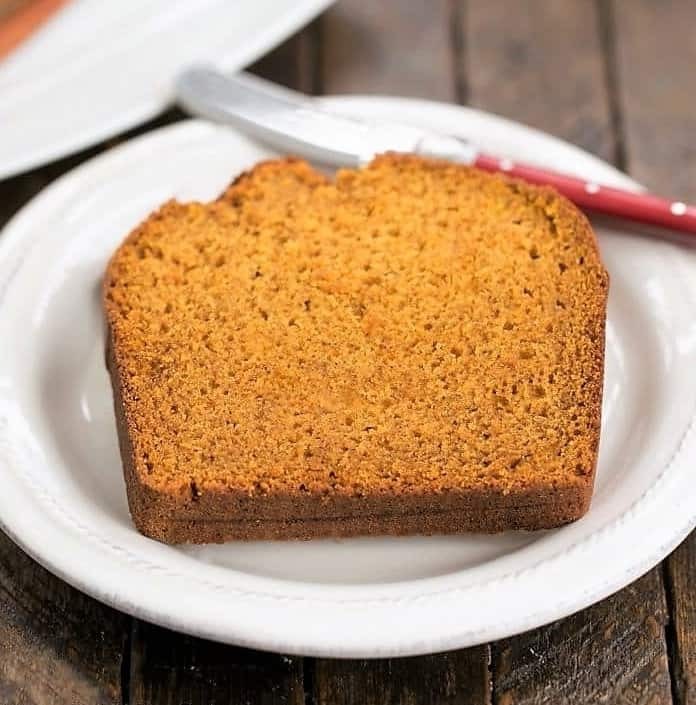 Cinnamon crusted pumpkin bread is a delicious twist to a traditional pumpkin bread recipe! It makes me a wee bit wary when I shake up our tried and true pumpkin bread recipe. But no worries, as this Cinnamon Crusted Pumpkin Bread was a hit! A week before Nick’s fall break from college, I inquired about any food favorites he’d like me to prepare. He pondered this for a few seconds and quickly came up with pumpkin bread. Coincidentally, this was one of the foods I craved when I was first away from home, too. Steak and pork chops made the short list, too, but those were a given. He’d been cooking for himself and I think he and his buddies hadn’t advanced past Sandwich 101. I kicked this recipe up a notch and made Cinnamon Crusted Pumpkin Bread. Well, it was no surprise when loaf number one disappeared in a flash. Number two was hidden deep in the freezer for Nick to take back to his apartment. You should see the thick slices that made their way to my kids’ breakfast plates. I was concerned that shaking up the spices from my tried and true recipe and the sprinkling of cinnamon sugar might dampen the appeal of these loaves…but not at all. It was inhaled. Cinnamon crusted pumpkin bread would be perfect for your Thanksgiving breakfast, or if my kids had their way, any breakfast of the year. 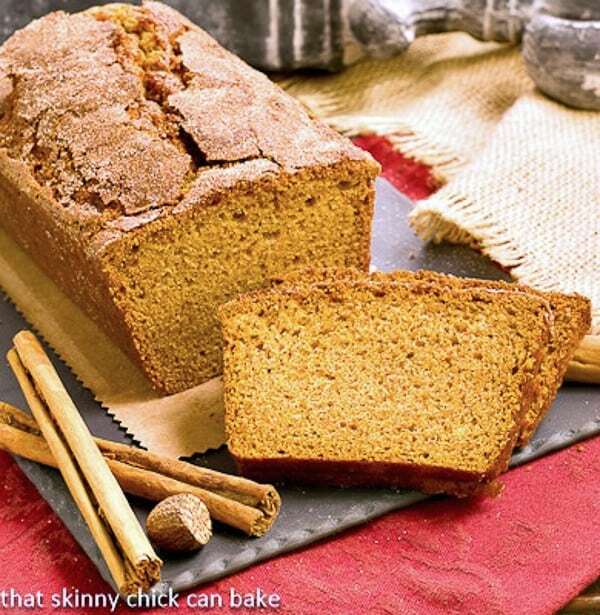 Moist and delectable pumpkin bread with a yummy cinnamon sugar topping! Preheat oven to 350º. Grease two 8 x 5-inch loaf pans, line bottom of pans with parchment, then grease the top of the parchment. In a large bowl, beat together pumpkin, oil, water, and eggs until smooth. In another bowl, whisk together flour, sugar, baking soda, cinnamon, nutmeg, and cloves. Add flour mixture to pumpkin mixture and mix till combined. Mix together cinnamon and sugar in a small bowl. Pour into pans, sprinkle with cinnamon and sugar mixture, and bake for 1 hour, or until a toothpick inserted in center comes out clean. Let cool in pans 10 minutes then remove to wire rack to cool completely. 3. Have your Twelve Loaves bread that you baked this November, 2013, and posted on your blog by November 30, 2013. MMM cinnamon crusted? 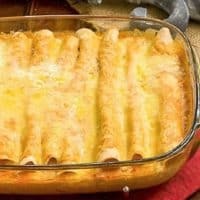 I’d bet this is so good without butter or anything on it! Just the way it is. Your bread turned out so beautiful! I love pumpkin bread and I can practically smell that gorgeous cinnamon crust! Pumpkin perfection! I’d be tempted to inhale this cinnamon sugar crusted bread, too =) How lucky Nick is, by the way, to have such a caring mom. This loaf looks delicious. I love the cinnamon crust. I haven’t made a pumpkin loaf this year, so I will have to try this one. The crust would probably dissppear in a flash under my watch… it’s gorgeous Liz! And having a ravenous guy come back from college is awesome, he’s probably eating everything you make and that is always so rewarding, isn’t it? This is HEAVENLY! Gosh..I want this so badly! Just look at that wonderful cinnamon and sugar topping! D-lish!!! I’d like a big slice too please! love this! for me as well, when it’s Fall, I’m all about Pumpkin bread. . love it! Nick is a smart kid 🙂 looks perfect! I love pumpkin bread, and I can’t imagine anything better than one with a cinnamon crust on top. Pinning! Yes, please! My slices would be fat and plenty, as well. This sounds amazing (how could anything crusted in cinnamon not!?). Cinnamom and pumpkin is a great combination of tastes. 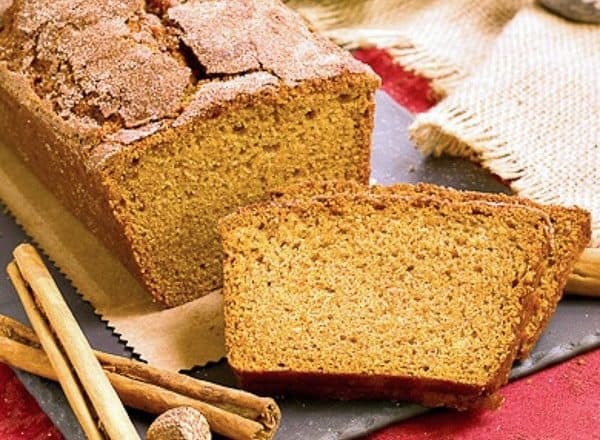 The cinnamon crust sounds perfect with this pumpkin bread. I hope you had a good visit with your son– how far away from home is college? It’s nice Thanksgiving break is right around the corner too! 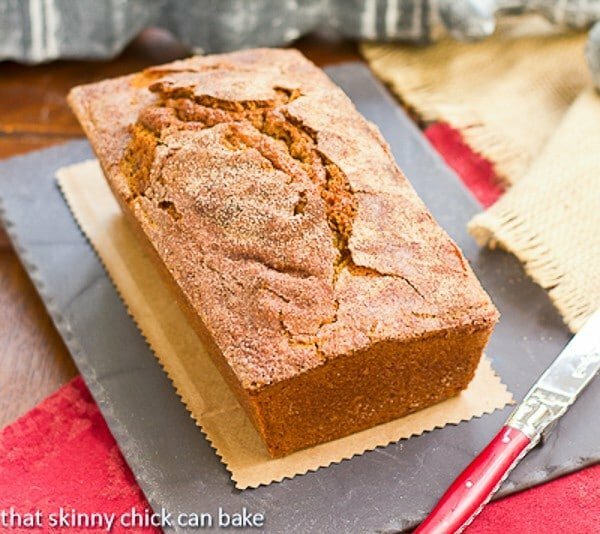 Oh yum…I adore pumpkin bread, I love the crusty top on this one. I need to do some baking! 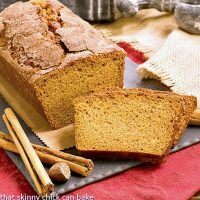 I love pumpkin bread and the cinnamon crust just adds another wonderful dimension. 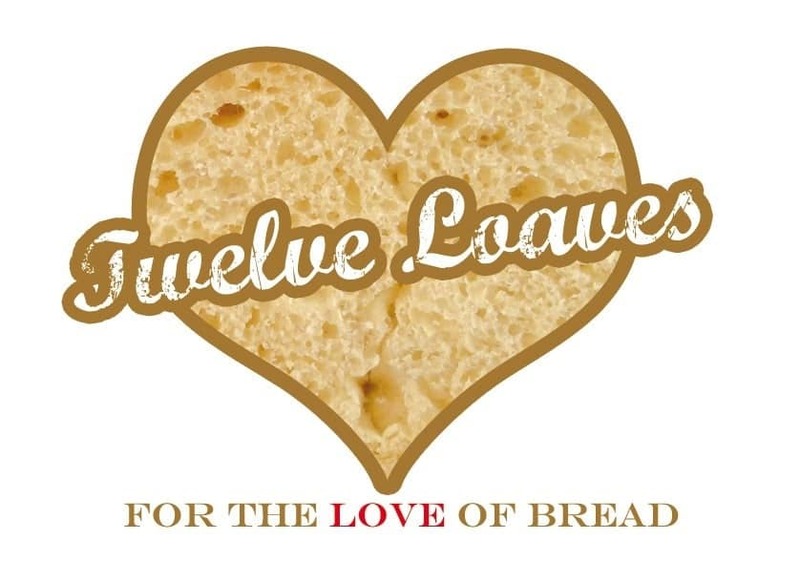 I’ll have to put on my thinking cap to figure out what I’m going to submit to twelve loaves this month. Cinnamon crusted are two beautiful words which both describe and enhance the beauty of your bread. Wow Liz! I’d love a slice right now. Liz, this looks so great. It is a great side to serve with so many things. Thx for sharing. That’s funny that this was also your favorite treat. Nick has good taste! Fantastic loaf, Lizzy. My kids also adore pumpkin bread. Now I will make your lovely cinnamon crusted version. Thank you for being a part of #TwelveLoaves, Lizzy! I couldn’t wait to make this and I didn’t! 2 loaves ready for Saturday breakfast. Now…how many will still be there in the morning??? I’m sure I’d pick off most of the crust and I can imagine how great this smells. 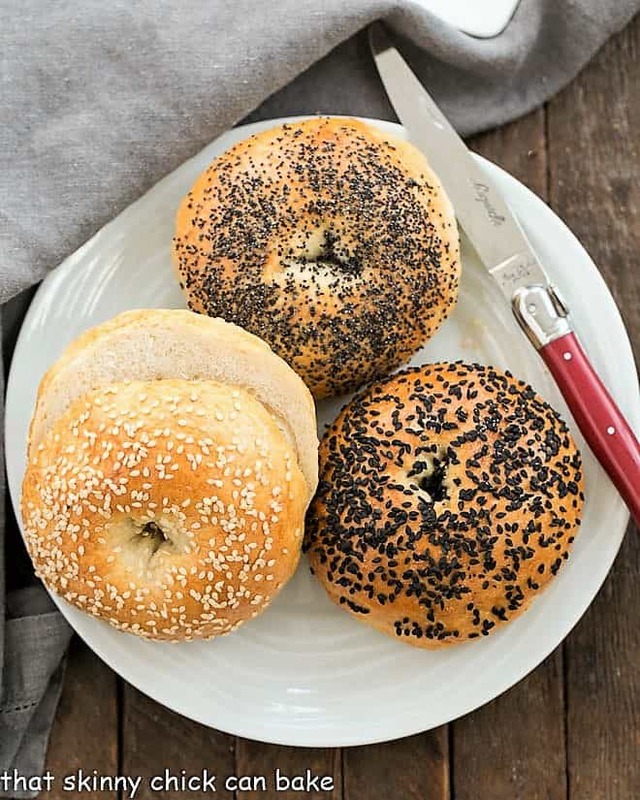 Liz, loving absolutely everything about this recipe and the whole post – your recipes with all those lovely, warm spices and the cinnamon sugar on top of the loaf sounds fantastic! Isn’t it great fun to bake for college break? My son and his four best friends invaded our home in mid-October. It felt like Thanksgiving… hours in the kitchen, cooking, laughing, talking and eating. Then clean up just to start it over again. The college kids included my younger kids in the fun and we all wished it could go on a few more days. This pumpkin bread looks absolutely gorgeous. 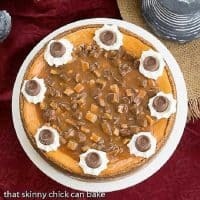 The cinnamon crust on top?! LOVE it! I never had pumpkin bread until I was an adult. 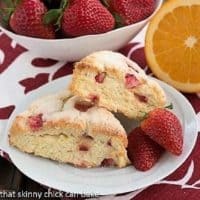 This looks wonderful and I especially love the cinnamon sugar topping! You had me at “crusted.” Sold! only you could bring pumpkin bread up a level!! love the cinnamon sugar topping!!! Cinnamon Crusted Pumpkin Bread smelled, looked and tasted delicious! 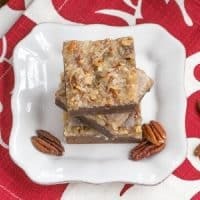 The cinnamon sugar, crusted top is unique and very tasteful and even a picky eater will want to try this! 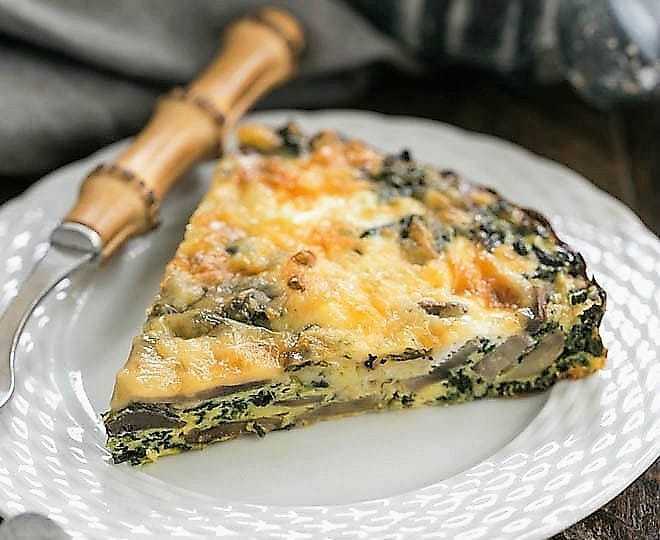 Thanks for this recipe, it taste like it looks, scrumptious! Thanks so much for the review, Sandy! I’m so pleased you made this bread and even more thrilled that you enjoyed it. Hope you have a terrific Thanksgiving. How do you store this so the top remains crunchy? Due to the moistness of the loaf, it’s nearly impossible to keep the top crunchy. You could try slicing and freezing those slices you won’t eat the first day, but I’m not sure that is a sure fire solution either. If you’re planning to serve it to company, I’d recommend baking it on the day you plan to eat it. Wish I could be of more help. I can’t believe I never commented on this bread! I’ve made it so many times! It’s DELICIOUS!